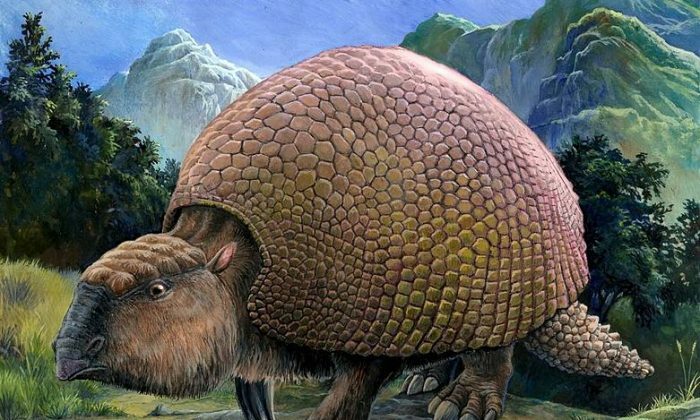 Glyptodon was an armadillo-like creature, roughly the size of a Volkswagen “Bug.” The Glyptodon lived near water and ate plants, similar to the diet and lifestyle of a modern turtle. It was from the Pleistocene, Pleistocene Epoch, which was 2.6 million to 11,700 years ago, according to Berkeley University. The woodland musk ox, or Bootherium bombifrons, was much taller and leaner than today’s modern musk ox. Weighing close to 1,000 pounds, it was one of three species of oxen in North America during the Pleistocene Epoch. All these creatures are from that geological epoch, the last before our own. Giant ground sloth, or Megalonyx jeffersonii, once lived in North America, and its bones were found on Thomas Jefferson’s estate. Weighing up to 1 ton, this creature fed on leaves using its three claws on the forearm. Jefferson thought it was a kind of lion, which might still live in western America, he told a 1797 meeting of the American Philosophical Society in Philadelphia, according to Lewis–Clark.org. Panthero leo atrox, or the American lion, was one of the largest cats known to have ever existed, and many of its fossil are in the La Brea Tar Pits. The American lion was larger than today’s African lion. Atrox means cruel or frightful in Latin, according to the San Diego Zoo. It lived into the Holocene Epoch, the current epoch. The North American camel, or Camelops, originated in North American about 50 million years ago, according to the National Park Service. It lived in grasslands with abundant water. It was related to llamas. Cervalces scotti was a stag-like moose that lived in America’s Midwest, according to the Illinois State Museum. With a head like an elk, complex palmate antlers, and larger than today’s modern moose, these mammals lived much like modern moose. Arctodus, or the short-faced bear, was speedy and larger than any other living bear. It was a fierce predator, according to the University of Texas at El Paso. Remains of the short-faced bear were abundant in California, showing its extinction to be around 11,000 years ago. Dire wolf, or Canis dirus, meaning “fearsome dog” has been found in abundance in North and South America. Dire wolves were larger than today’s gray wolves, and probably not as fast on their feet. The Dire wolf may have been a scavenger instead of a hunter, according to the Illinois State Museum. Fiery pits of toxic gas, mud volcanoes, the deepest deep freeze, and more—take a trip to paradise by visiting the top 5 most Hellish places on earth.